You didn’t think I’d leave you hanging, did you!? 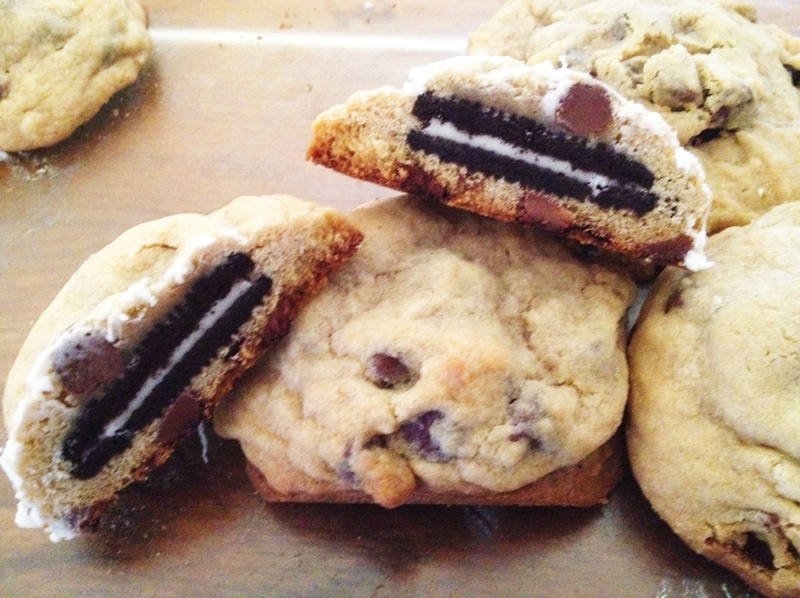 Yes, from my bake sale, here’s the recipe for Oreo-Filled Chocochip Cookies. Preheat the oven to 350 degrees. “Cream” butter and sugars together until well combined. It’s suggested you use a mixer, but I don’t have a mixer so I worked REALLY hard to do this work a fork. It worked. Once “creamed,” beat in the eggs and vanilla until it’s a nice consitency. In a separate bowl, combine the flour, salt and baking soda. Then slowly add and mix the ingredients from the wet bowl, little by little, until well combined. 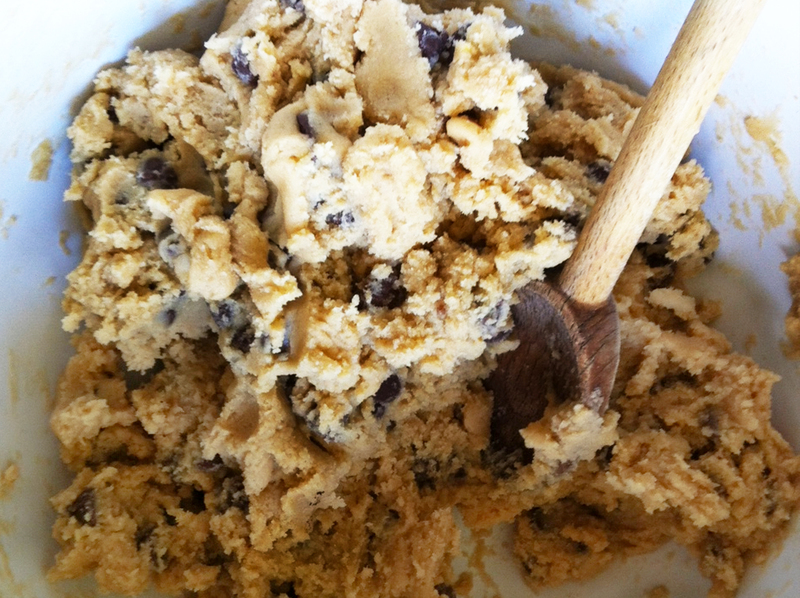 Add the chocolate chips and mix those in too. Taste your batter. Isn’t it delicious? 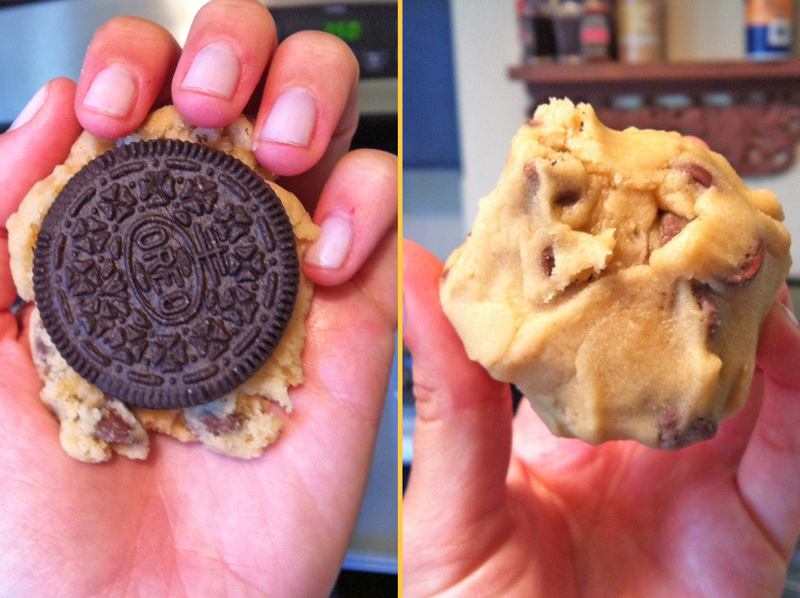 Now control yourself, pick up an Oreo, and wrap it in the dough. I made mine really meaty. Place the dough-wrapped oreos onto a greased baking pan, and cook for 10 – 15 minutes until the bottom of the cookie is a nice golden color. I took the cookies out while the dough is very soft, for I enjoy chewy cookies. Now look at these beauts! i think i just want and Oreo cookie/cookie dough sandwich. Forget cooking it! Sheer unabashed pig out heaven. You have married America’s favorite two cookies. Brilliant!